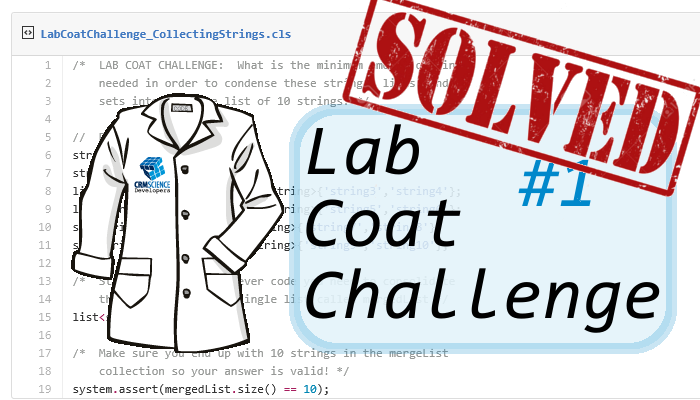 Lab Coat Coat Challenges: Challenge #1 Responses! Responses are in for our first Lab Coat Challenge! We had some great responses over the last week from several Salesforce devs! If you haven't had a chance to submit your answer for this challenge OR you think you can improve upon the answers below, please do! Early in the week, no two answers were the same. By the end of the week, we had several that made use of the list.addAll() method. Others techniques included various ways of pre-populating lists and even various string manipulations. So let's take a look at some of the responses! Note: Some code might have been modified up for readability. When we started preparing these challenges, I wanted to be sure to be able to provide an answer for each. So how did I approach it? Dynamically, of course!